Ph.D. student Sara ElShafie has created workshops to teach graduate students how to tell stories about science. But she doesn’t have that challenge anymore. Today, 28-year-old ElShafie is one of the few people in the country who focus on adapting storytelling strategies from the film industry to science communication. 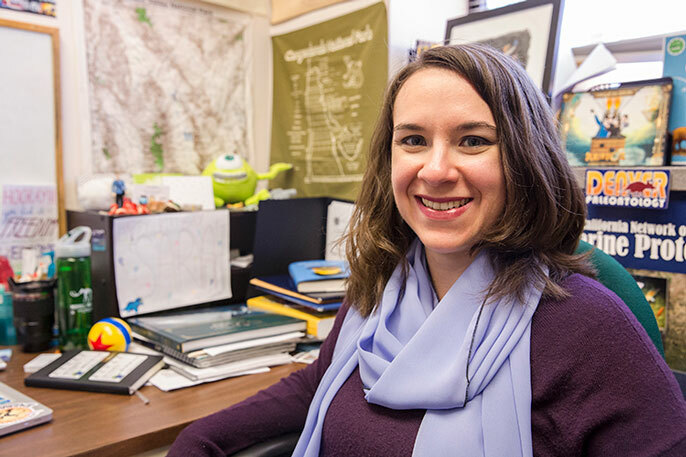 For the past year and a half, she has been leading workshops for scientists — primarily graduate students — on how to tell stories about their research that resonate with a broader audience. ElShafie found her storytelling solution at Pixar Animation Studios, in Emeryville. A Pixar fan her entire life, she emailed the company’s outreach department in 2015 and asked if anyone there would like to talk with students at the UC Museum of Paleontology about how to adapt strategies for filmmaking to communicating science to people outside the scientific community. To her surprise, two story artists at Pixar were interested and volunteered their time for the project. They collaborated with ElShafie to present a pilot seminar at the museum that attracted not only students, but faculty and staff. Seeing the project’s potential, ElShafie worked over the following year to develop a series of workshops inspired by Pixar. Last March, together with a Pixar collaborator, ElShafie presented the first public workshop on the Berkeley campus. Although the studio is not formally involved, additional artists at Pixar have been generously contributing their time and feedback. Drawing on examples from Pixar films and scientific studies, the workshops illustrate storytelling strategies that make science accessible by reframing research into a story with characters, obstacles and revelations. According to ElShafie, these techniques help to overcome scientists’ difficulty with communicating science about non-human subjects. Pixar films — often about animals — are great models, she adds, because they have compelling themes and emotional depth and appeal to a broad audience. A Pixar fan since childhood, ElShafie has a collection of Pixar figurines and toys in her lab in the Valley Life Sciences Building. ElShafie’s workshops not only help participants frame a message, but develop a conceptual framework for introducing scientific topics in the form of a story. With a worksheet she’s created to illustrate the parallel between filmmaking and science, participants leave the workshop having made an outline of a story about their own research. Extended workshops also explore how to use the visual language of animated films in scientific presentations. “She’s really enlightened the whole museum community on ways we can strengthen our own writing by applying storytelling techniques,” says Lisa White, assistant director of education and public programs at the UC Museum of Paleontology. White says she watched how ElShafie polished and perfected her workshop over the past school year and how the audience grew threefold, to nearly 200 people at workshops this spring. ElShafie offered her first official workshop, “Science Through Story: Strategies to Engage Any Audience,” in November 2016 at the annual meeting of the Western Society of Naturalists in Monterey. It was a hit, and she started to receive invitations to present it at other institutions around the state and country. Mallory Rice, a UC Santa Barbara graduate student who attended the Monterey workshop, invited ElShafie to present the workshop at her campus in April. “It was great to see the example of how she turned her own questions and research into a story, rather than thinking about (just presenting) it to the public with results and data,” Rice says. ElShafie hopes to hold the workshop annually at Berkeley. Sara ElShafie (far left) at a March 2017 workshop she led on campus for 200 people that included (left to right) Eric Rodenbeck, CEO of Stamen Design; Erica Bree Rosenblum, UC Berkeley associate professor of Environmental Science, Policy and Management; Lisa White, director of education at the UC Museum of Paleontology; and Daniel McCoy, technical director at Pixar Animation Studios. Upon arriving at Berkeley as a Ph.D. student in 2014, ElShafie knew she wanted a career in informal education leadership and eventually to become director of a major science museum. To achieve this, she sought scientific training as well as experience in communications and outreach. As an undergraduate at the University of Chicago, ElShafie had been involved in Project Exploration, a Chicago nonprofit that makes science accessible to underrepresented groups. One of its programs brought students from the inner city to campus for a weeklong intensive summer course. She remembered how the students were overwhelmed at the beginning, but completely transformed by the end of the week, confident and dying to share with others what they had learned. “That’s when I realized science is not just about learning science, but about discovering your potential and learning about the world around you,” ElShafie says. ElShafie chose Berkeley for her doctoral program because it could offer her training in both scientific research and informal education, and was especially drawn to the UC Museum of Paleontology, with its emphasis on outreach and public service. She got involved in the museum’s educational programming, giving tours to school groups and assisting with Cal Day activities. Her lecture at Cal Day 2017, “Real-World Fantastic Beasts and Where To Find Them,” was another opportunity for her to apply her skills in explaining science to the public. ElShafie studies lizard fossils and how climate change has affected animals throughout history. For ElShafie, balancing science communication workshops with her dissertation research has not been easy. But she spends whatever spare time she has on this passion project and is running workshops across the country. She has given six workshops in the past year and has four more coming up, including one in June at the Smithsonian National Museum of Natural History. Job-seekers with communications expertise are in high demand in areas such as interaction with policy-makers and data visualization for scientists, says ElShafie. For ElShafie, paleontology is “the perfect gateway to other sciences” and also involves art and imagination. She enjoys the feeling of holding the evidence — like a fossil — in her hand, imagining the animals and their past lives, and then bringing them to life for other people. “I learned that there are many parallels between the creative process of filmmakers and of scientists,” ElShafie says, adding that stepping outside one’s profession and looking at it from another lens, for a fresh perspective, is always valuable. NOTE: For updates on ElShafie’s workshops, follow @sci_story on Twitter or join the mailing list for public workshops at tinyurl.com/science-story-mailing-list.